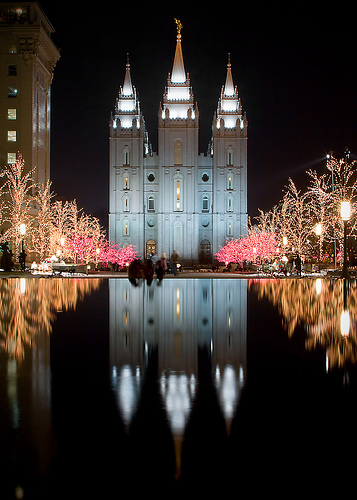 The Salt Lake City Mormon Temple on Temple Square during Christmastime. Anyone who visits Temple Square—the headquarters of the Church of Jesus Christ of Latter-day Saints, aka LDS, or “Mormons”—in downtown Salt Lake City, Utah cannot help but notice how image-oriented the LDS Church is. In the warmer months, the lawns of Temple Square are well-manicured, the shrubs are trimmed to perfection, and thousands of colorful flowers that never seem to wilt are beautifully arranged around the buildings and along the walkways. In the winter months, scenes from the nativity are placed in open areas, the trees are wrapped tightly in vibrant lights, and Christmas carols are sung by church members and missionaries, or played over an outdoor speaker system throughout the square. Even the city streets immediately surrounding Temple Square are well-maintained by the LDS Church, which recently spearheaded a five billion-dollar project to clean up and revitalize downtown Salt Lake City—a project that included the construction of a 1.5 billion dollar open-air shopping mall directly across the street from the south entrance to Temple Square. But Temple Square, with its 3 to 5 million tourists each year, is far from being the most heavily-trafficked location in Mormondom; that title goes to websites such as lds.org, mormon.org, and the thousands of other Mormon-themed web pages that can now be found on the Internet; and with the increased attention and web traffic the Church has been getting due to LDS presidential candidates, reality television shows, and a Broadway play, the Church has taken its almost-obsessive image-grooming campaign online. Just as visitors to Temple Square quickly notice the strict attention that is given to keeping the grounds attractive and clean, visitors to lds.org and mormon.org quickly notice how the Church attempts to portray a squeaky-clean image of a religion that is suitable for anyone. Although the 15 positions that make up the hierarchy of the Church—the president, his two counselors, and the 12 apostles—are currently filled by white males (and always have been filled by white males since the Church was founded nearly 200 years ago), the Mormons have been ramping up their online efforts to show that the Church is not intended to be a faith solely for white people. A visit to Mormon.org—a website that was created specifically for those who might not know much about the faith and would like to learn more—reveals a homepage with a background that slowly transitions between the faith story and accompanying photograph of five ethnically diverse Mormons: an elderly white couple, a woman from the Pacific Islands, a Hispanic man, and a Crimean man, all smiling elatedly. 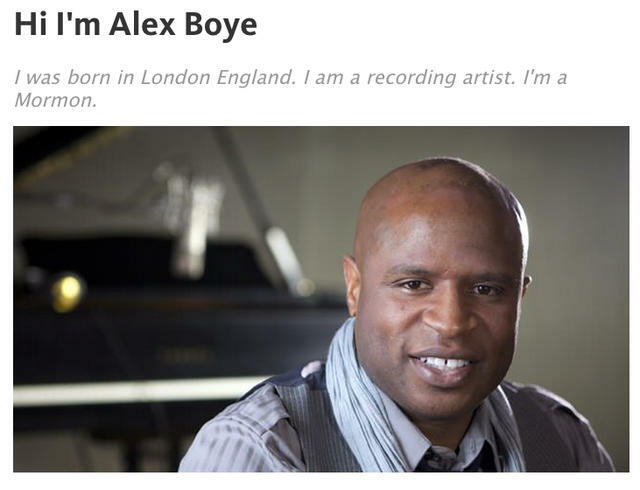 An example of a profile from the LDS Church’s “I Am A Mormon” campaign. The videos, which are part of a larger public relations campaign called, “I’m a Mormon,” are designed to show that Mormons actually do come from all backgrounds, professions, ethnicities, and social classes. mormonnewsroom.org describes the “I’m a Mormon campaign as an effort to “break through the stereotypes of what people think they know about Mormons and demonstrate that the Church consists of diverse people from all walks of life who seek to follow Jesus Christ.” After watching a few of the videos, one gets the impression that the Church is making an attempt to steer people away from developing an image of an ultra-conservative, xenophobic religion. At mormon.org and other Mormon websites, visitors can physically see what the LDS Church has done to create a clean, well-groomed image of itself, but most of what the Church does to maintain a positive image online is done behind the scenes, with search engine optimization (SEO), a process in which a variety of techniques are used to improve the visibility of websites and web pages on Internet search results. In fact, the Church has been so proactive with its SEO efforts, that Google used the Church as an example at an online marketing conference in 2010, when analytics expert Avinash Kaushik highlighted how extensively and effectively the Church uses SEO tactics; the Church, however, likes to remain quiet about its use of SEO. The LDS Church began its SEO efforts in 1996, and now has three groups working to optimize its reach and image on the web. The first group is the Church’s internal IS Department, which works to promote sites like lds.org and mormon.org; the second is the online missionary program, which is made up of full and part-time missionaries who utilize social media sites, such as Facebook, to proselytize and direct traffic to the Church’s official websites. When their missions begin, these ‘social media’ missionaries are asked to deactivate their personal Facebook accounts and create official missionary Facebook accounts so they can post LDS-related material and chat with people who are interested in learning more about the Church. 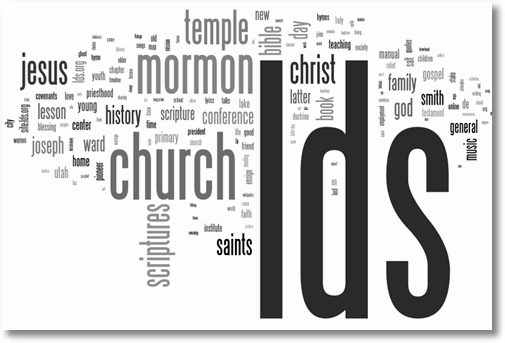 A word cloud representing popular terms for Mormon-related web searches. The third group is a combination of several grassroots organizations that are not formally tied to the LDS Church. These groups are encouraged by Church leaders to advance LDS causes, build the faith, and improve the Church’s image online. It is usually these grassroots organizations that take the lead when it comes to sensitive and controversial issues, like Proposition 8 in 2008, and the marriage debates in Hawaii in 1997; by encouraging these ‘unaffiliated’ organizations to promote their viewpoints and opinions, the LDS Church can remain in the background and avoid or deflect any criticism or negative publicity. In an age when new information is disseminated almost instantly to a forum that includes most of the world, we are seeing religious institutions become more cautious and innovative when it comes to projecting their images online; the LDS Church is a prime example of this. With costly online PR campaigns, social media missionaries, and an army of grassroots SEO organizations, the Mormons appear to be making every possible effort to make their religion palatable for the masses. I am glad that the LDS Church “cuts a fine figure on and off the field.” I am a Mormon. It is my goal and the goal of most every Latter-day Saint (follower of Christ) to become as much like Christ in our everyday lives as is humanly possible. Since the leadership of our church are not professionally trained evangelists but rather lay members of our church, church leaders have those same goals for themselves and the church as a whole. Surely Christ did all He could to create a peaceful, warm, welcoming and beautiful environment where ever He was. Church members strive to create that same environment in their own homes, in their lives and in their places of worship.